In 2006 I was hired by BMW to launch up2drive.com, a “startup” within the company to finance cars of ANY make and model (other than BMWs). In a few short years, we quickly became an online auto finance leader. 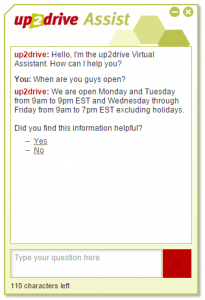 Today, my team launched a virtual chat assistant on up2drive.com. Think of it as Siri but for your web site. Just ask it questions that you would do if there were a real human on the other side. 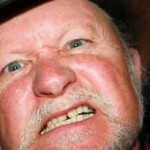 If your conversation is about up2drive, it should do a decent job answering you in an intelligible way. It also knows the time of day and changes prompts like “Good Morning” to “Good Afternoon” accordingly. What I really like is it gives short answers just like a normal chat or IM conversation. Instead of an FAQ where you’d have to read a lengthy answer to pick out what applies to you, up2drive Assist starts asking clarifying questions. Ask it “I’m having trouble logging in,” and it will ask you if you have an existing loan with up2drive or have recently applied. It will then ask where you applied to give you the most direct and brief answer. For the next few months, the conversations may seem a bit rusty – but we’ll be watching it daily to update the language database. Everyday we’ll improve upon the responses. Hopefully by February or March of 2015, it will be 99% there. Try it for yourself at www.up2drive.com.